Ok, the era, when people throw old things without reusing them in order to fill the gaps with new goods has come to an end. Recycling and eco-friendly ideas have put a new beginning for usage of all kinds of things. This way of consumption and valuing the world and nature gives a new approach into the magic of craftsman, inventiveness, artwork and practicality. Thus, an old ordinary thing can live a new life with a new mission and a new application. Sweater cuffs or stylish bracelet – all you need is an old colourful sweater and an old bracelet. Wrap it and sew in the edges. Winter mittens – use your old sweater for making a pair of awesome mittens for you or for your kid! In case you want something original and stylish, make some fingerless gloves directly from the sleeves of the sweater by making a hole for the thumb. Cozy interior additions – embrace jars or coffee cups in yarn and arrange them symmetrically on the kitchen shelves. Isn’t this the cheapest and sweetest idea for some home renovation? Floppy bag for store solution – big-sized sweater can actually accommodate other old things and get you more spaciousness in a premise or in the closet! Vintage chandelier – wrapping and dressing again! A plain lamp can turn into stylish and original retro chandelier with the soft and colourful yarn! Kitchen holder – after steam oven cleaning and cooking the area in the kitchen premise becomes really hot! So, equip yourself with a holder to serve the dinner artistically and safely! Bed for pet – giving your entire life to your cat or dog, you must be able to give your own clothes too! 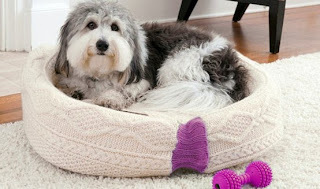 Make a convenient sleeping area for your pet with warm and cute sweater. Mobile device case – laptop, iPod, smartphone, e-reader, tablet or digital camera can be more protected and more originally stored in a winter sweater. By all means, these are only few of the offers and suggestions for new usage for an old sweater. However, they are enough to open your mind and set your imagination free!